This episode is proudly sponsored by BuskinCity – a platform for professional street performers to book their own tour in different parts of the world using a simple booking calendar. For more information please visit the BuskinCity website and huge thanks to Thorsten Andressen and Ulf Andersson and their team for sponsoring this episode! Location: Recorded in the courtyard of the Wheatsheaf Hotel during the 2014 Adelaide Fringe Festival. Comments: It’s interesting the choices each of us makes that bring us to the world of Street Theatre. Damien Ryan could have been a professional footballer, he could have been a full-time musician, he could have studied any one of the 64 arts and made a career out of it, so why was it that becoming a Circle Show Performer was the career he ended up sticking with? There’s a moment during this interview where Damien, suggests that you have to be cut from a certain cloth to not only become a street performer, but also to stick with it. Part of it is tenacity, part of it is certainly creative, part of it comes from the rush you get when standing in front of a crowd, but to stick with it for over three decades requires something more. 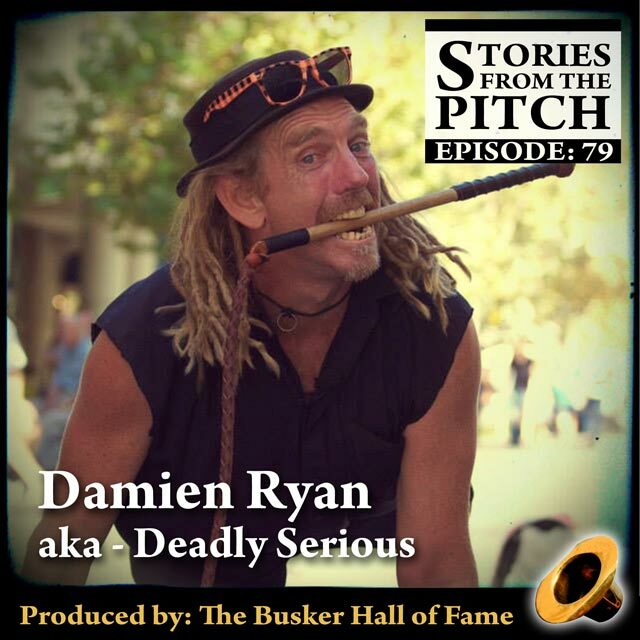 Eric Amber connected with Mr. Serious during the 2014 Adelaide Fringe to peel back a few layers and find out how Damien Ryan became his alter ego Deadly Serious during a career that’s spanned more than three decades and so many countries around the world. And thanks again to: BuskinCity for sponsoring this episode! This entry was posted in Bio-Episode, Eric Amber, Interview, Street Performing. Bookmark the permalink.